Sclerotherapy: Treatment of Varicose and Telangiectatic Leg Veins, by Drs. Mitchel P. Goldman, Jean-Jerome Guex, and Robert A Weiss, equips you to implement the latest cosmetic procedures for the treatment of varicose and telangiectatic leg veins. 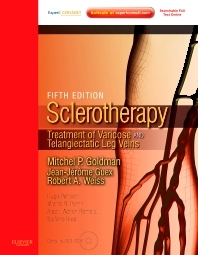 Completely revised with contributions from U.S.-based and international authorities, this classic reference is packed with everything you need to know about sclerotherapy, and provides extensive discussions of the latest techniques, solutions, and possible complications. Case studies, detailed color illustrations, and procedural videos on DVD-ROM offer practical, step-by-step visual guidance as well as expert hints and tips for implementing the latest cosmetic procedures into your practice including foam sclerotherapy, endovenous radiofrequency (RF) and laser closure, ambulatory phlebectomy and laser treatment of spider telangiectasia. You can also access the full content and videos online at www.expertconsult.com. Optimize outcomes and improve your surgical, injection and laser techniques with comprehensive, visual guidance about common pitfalls and "tricks of the trade" from practically minded, technically skilled, hands-on experts.